Bali Rafting + Ubud Arts + Kecak Dance Bali Tour is one of Ayung’s best-loved Bali rafting packages, which will combine with an amazing Bali sightseeing tour to the villages of Ubud Arts where you can see the artist on their action, the Tegenungan Waterfall, then end with a stop in Batubulan village to watch the Kecak and Fire dance with Ramayana Story. Bali Rafting Adventure always create something new for your rafting tour in Bali. 14.00 – Visit Mas Village. 15.30 – Visit Tegenungan Waterfall. 17.00 – Visit Celuk village. Come and join the Ayung River professional team to enjoy fantastic and unforgettable whitewater rafting adventure in Bali through a winding gorge, the magnificent jungle and the beautiful terraced rice field. The water volume is stable all year round with few water speed, which allows you to enjoy yourself with lots of fun. From the start, you will be fitted with life jackets and helmets for your safety. Our experienced guides will lead you through your thrilling Ayung rafting adventure in Bali for about 2 hours. Follow his instructions and paddle along the way, laughing, shouting and having an unbelievable adventure. 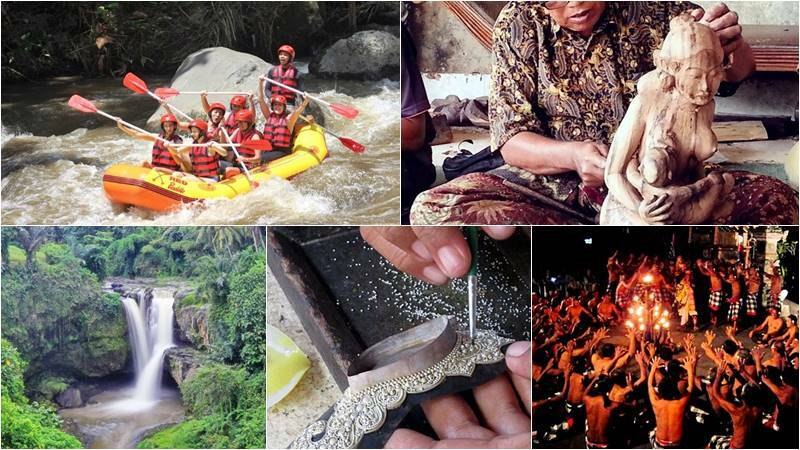 This is the best way to experience the amazingness of the Ayung River. Mas Village is one of Bali’s main villages identified as an artistic countryside by focusing on wood carving. It is located in the sub-district of Ubud and in Gianyar Regency, east of Bali. It possesses the typical woodcarving style by placing humanism and naturalism forward to the distinctive synergy. The village is famous as an art village on the national and world levels, not to forget the name of some masters who have born and found spirit (taksu) and soul. Ida Bagus Tilem is the famous maestro who was born in this village. An amazing waterfall view, stop at nice spot for taking some photos. Tegenungan waterfall is unique because of its lush green surroundings and heavy flow of water. As a tourism destination, Celuk Village is the famous village in Bali, and local inhabitants are very proactive and full of innovation in gold and silver handicraft. Situated in Sukawati, Gianyar Regency, this village has the individuality and excellence in the making of gold and silver. Most of them are professional, artistic and knowledgeable Balinese designers in the field of silver and gold making. Now some famous shops were born with a unique style.